It may be useful to understand the strategic importance of culture for Scotland by considering the concept of cultural needs. This submission argues that every individual has cultural needs and that these needs can be satisfied in a range of ways including engagement with the arts. The concept of ‘cultural needs’ is relevant to all definitions of the term culture and recognises that engaging with the arts is only one of the many ways in which cultural needs can be met. The term ‘culture’ can include ‘way of life’, customs, leisure activity, language and beliefs, all of which are relevant to a consideration of cultural needs. Cultural expression can include the arts but it call also include other forms of expression including gardening, sport, language, dress, and much more. To better understand what ‘cultural needs’ are, it may be useful to consider the extent to which needs can be met through Scotland’s ‘cultural offer’. When individuals choose to go to the theatre, visit a gallery or museum, use a library or attend an arts festival, it is clear that they are responding to a cultural offer. The Culture Strategy is likely to identify the value of Scotland having an excellent cultural offer in a national and international context and the value of accessing these opportunities should undoubtedly be recognised. As well as the culture ‘offer’ (which tends to imply cultural agencies operating in a market place in competition with other demands on people’s time and disposable income) there are a number of opportunities to participate in culture as a participant. Examples that will be likely to be recognised as important are community arts activities, creative clubs and groups, local festivals and events and much more. Of course there are also many links between cultural organisations and agencies and community activity including community outreach programmes, education projects, etc. In all of these cases the people involved will be satisfying a cultural need. Abraham Maslow was an American psychologist who is best known for proposing a ‘hierarchy of needs’ model in 1943. Maslow’s theory of psychological health and wellbeing is predicated on fulfilling innate human needs in priority, culminating in self-actualisation. This simple pyramid diagram shows a five tier model of human needs. It suggests that people require their most basic needs to be met before they are motivated to move up the pyramid to the higher levels. Physiological needs are the most essential and the most motivating and the fulfilment of these needs provides a necessary foundation before higher level needs can be pursued. 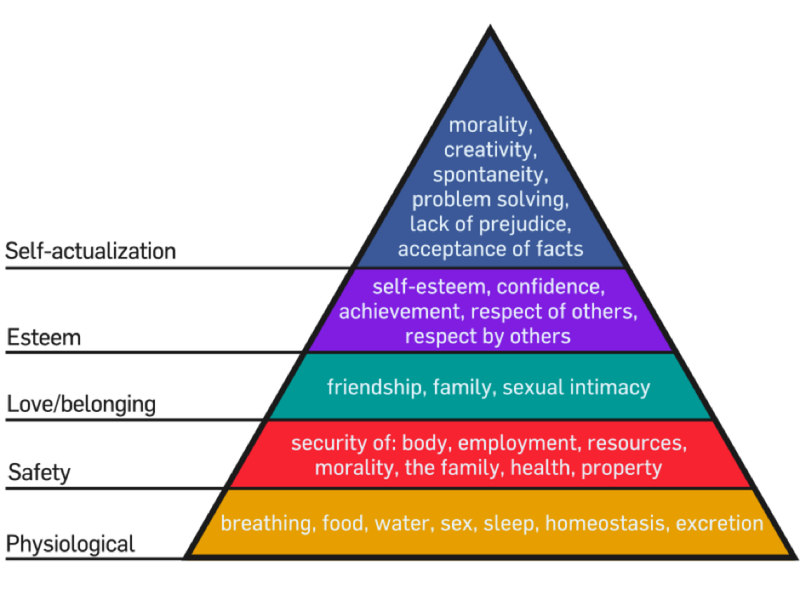 The next three levels are not essential for biological survival but they are presented by Maslow as the basis of good psychological well-being. Creative activities are shown as a self-fulfilment need where achieving ‘self-actualisation’ is understood to be the highest pinnacle of human motivation and therefore highly rewarding for any individual to achieve. Situations where economic, environment and psychosocial needs are not met present a fundamental risk to health and wellbeing. Support to improve social and economic outcomes often focuses on helping people to act upon a range of needs at the same time and this should include support to meet cultural needs as part of a holistic approach to achieving positive outcomes for individuals and communities. The same approach applies for early intervention and prevention initiatives where meeting cultural needs can build resilience and contribute positively to the achievement of other important outcomes. The idea of cultural need is that every human being is innately creative and will flourish when these needs are met through opportunities to engage creatively. Cultural needs can be met in a wide variety of ways. The evidence of the health and wellbeing benefits of accessing the arts is one important example of how this can be achieved, particularly as some life experiences can limit, frustrate and sublimate cultural needs. If you believe, as we suggest the Culture Strategy should, that the capacity to be creative lies within every human being from birth, this suggests the need to intervene strategically to address any barriers to realising creative potential as a feature of a health inequalities programme of action. If innate creativity is not fostered and exercised it is likely to lie dormant and perhaps decline. This makes fostering creativity in children especially important and also points to the importance of engaging with culture for people who are exposed to the health damaging factors that cause health inequalities. This paper suggests that Scotland’s Culture Strategy can play a role in addressing some of these issues by adopting a ‘cultural needs’ approach which aims to maximise the positive impact of culture for all the citizens of Scotland whilst paying particular attention to the needs of people who would not be likely to achieve this benefit without support. Two priority groups to consider are children and people with health and care needs. In both cases, these groups may need particular support to retain, access, develop and inspire their creativity. If their cultural needs can be better met it is possible that their other needs will be positively affected. These benefits are relevant to the health needs of the whole population, but the benefits can be particularly significant for people experiencing the social determinants of ill health. The World Health Organisation defines the social determinants of health as ‘the conditions in which people are born, grow, work, live and age, and the wider set of forces and systems shaping the conditions of daily life’. The health inequalities caused by these social determinants are particularly marked in Scotland where the difference in life expectancy between affluent and deprived areas in men and women is 11 and 12 years respectively. Efforts to address health inequalities are seen as a matter of social justice and a means of achieving sustainable economic growth. The Creative Health report also notes that the demographic reached by arts for health programmes is often the least likely to visit arts venues and events. It would seem that there is a correlation between having significant health and care needs and cultural needs not being met. The experience of Art in Healthcare and other organisations developing and delivering cultural activity with a health agenda is that supporting people to meet their cultural needs can have a transformative effect on their health. The health-promoting value of culture is often felt particularly in relation to mental health and wellbeing. A needs based approach is well-established for statutory and community-based health and social care in Scotland. Providing person-centred care is seen as a priority with the aim of ensuring that treatment and support is not standardised. In nursing, for example, there is a desire to focus on the patient’s personal needs, wants, desires and goals so that the individual can be central to the care and recovery process. However, where it is necessary to address medical needs it can sometimes be difficult for that person to retain a sense of individuality. The Realistic Medicine approach – as advocated by the Chief Medical Officer – has introduced a renewed focus for health and care to be person-centred with the individual at the centre of decision-making and a personalised approach to care. Engaging with culture offers an asset-based approach which chimes with the ambitions of Realist Medicine. The experience of Art in Healthcare is that meeting cultural needs by engaging with art can complement or even provide an antidote to the medical model, particularly where mainstream medical treatments are either not available or may not be appropriate for the individual. Physiological needs are addressed by medical treatment and culture can address additional un-diagnosed needs, such as stress and anxiety due to a health condition. As well as achieving benefits through specific art for health programmes, a cultural needs approach can also achieve positive health and wellbeing benefits for the wider population. For example, a public health promotion campaign about the value of culture would help ensure that citizens are encouraged to engage, some of whom may have the means but are not currently choosing to respond to the cultural offer or participate creatively. This would connect well with existing work to promote good mental health through six ways to wellbeing (see Creative Health report, p.18): connect, be active, take notice, keep learning, give, be creative. A cultural needs approach also has the potential to benefit all the citizens of Scotland by being ‘proportionately universal’. This term was introduced by the Marmot Review in England suggesting that health actions must be universal, not targeted, but with a scale and intensity that is proportionate to the level of disadvantage. The scale and intensity of ‘arts for health’ programmes show how proportionate universality is also relevant to consider for culture. The quality of Scotland’s cultural offer remains extremely important and is a key contributor to the ‘triple bottom line’ - reporting and auditing the social and environmental as well as financial performance of the nation. Valuing, supporting, encouraging and enabling a diverse and vibrant cultural scene is a good indicator of Scotland’s overall confidence and wellbeing. Making this offer universally remains important. There are many circumstances where people have health and care needs and would benefit from opportunities to engage with culture. Many cultural organisations have used an outreach model where initiatives have targeted the ‘difficult to reach’ including people with health and care needs. It is now recognised that it is the agencies, services and organisations that are difficult to reach and efforts should be made to address the barriers to access. A cultural needs approach better supports the efforts of the cultural sector to ensure that the resources they offer are designed to address inequalities whilst also providing choice and opportunity for people who may not experience these barriers to access. There are many ways in which support and intervention can be designed to better meet cultural needs. Attached to this submission is a full description of the work Art in Healthcare has been undertaking using a social prescribing model to bring the benefits of art to people with mild to moderate mental health needs. There may be an opportunity to build further on this approach by making a formal connection between the cultural sector and the Community Link Worker network. Community Link Worker posts aimed at mitigating the impact of the social determinants of health for people living in areas of high socioeconomic deprivation are currently being appointed. A Community Link Worker (CLW) is a generalist social practitioner based in a GP practice serving a socio-economically deprived community. They support people to achieve their goals by enabling them to identify and access relevant resources or services in their community. The cultural sector has significant resources to offer in a community context and good communication between the sector and CLW network would provide an opportunity to build further on the existing cultural sector work to address inequalities. Finding a way to provide continuity of funding to support this work would bring significant and sustained benefits for people living in areas of high socioeconomic deprivation. Social prescribing is only one model for better meeting cultural needs and health and wellbeing needs; it is envisaged that the ‘cultural needs’ concept will engender further ideas about new models and approaches as part of the Culture Strategy preparation process. A cultural needs approach is also likely to generate new ideas for education and other aspects of cultural provision for children and young people. Expertise on child development and the ways in which Scotland can become a nation where creativity is fostered and all children have their cultural needs met is likely to come from other respondents. As an agency focused on the health and wellbeing benefits of engaging with art, Art in Healthcare looks forward to engaging further with a wide range of other agencies, partners and individuals about the value of a cultural needs approach in relation to health, care and wellbeing needs.